Simon Yam advises Natalie Tong to be "bad". 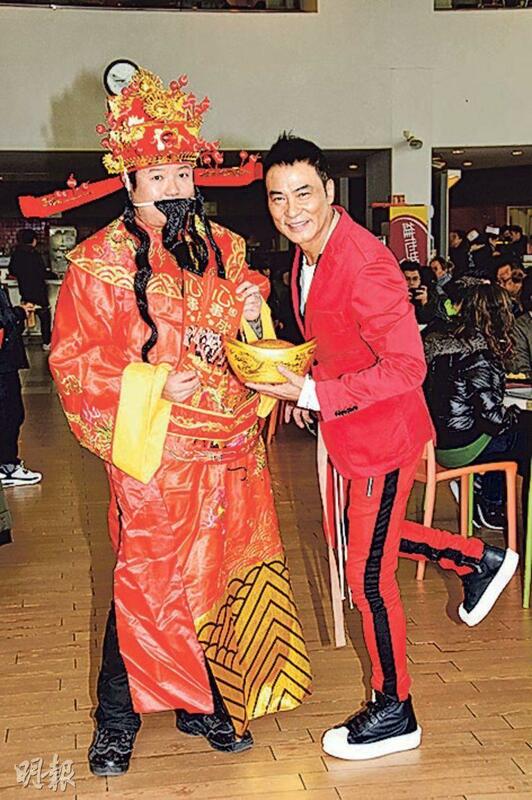 Simon Yam picks up a plate of barbecue and rice. Does he want a bite? Simon Yam Tat Wa, Natalie Tong Sze Wing, Ivana Wong Yuen Chi, Alex Fong Lik Sun, Philip Keung Ho Man yesterday promoted their Lunar New Year film A BEAUTIFUL MOMENT (NGOR DIK CHING DIK NUI SAI) at TVB City in Tseung Kwan O. Brother Wa said that he felt like he has returned to the series production big family. He said that if time would permit, this year he would consider playing a cop again in a series. His first condition would be ten hours of rest everyday. He also praised Nancy Wu Ting Yan by name for her acting! 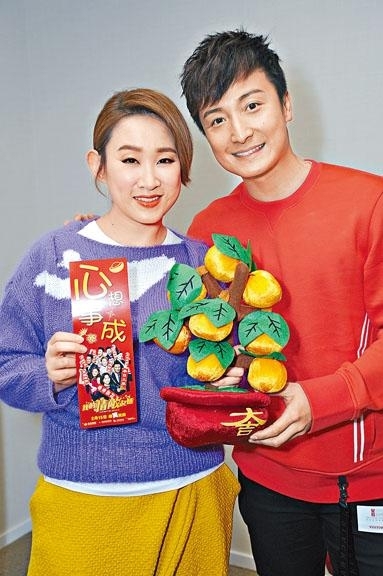 The actors gave away Lunar New Year couplets at the TVB City canteen, attracting many workers to get photos. Brother Wa revealed that he savored his days of working on a series 40 years ago, when a group of people was together for several months and felt like a big family. This year he would consider making a series, as he really wanted to play a cop again. "This type of characters has a lot of conflicts, work and family could have different conflicts, with a lot of potential." Has he paid attention to TVB actresses? Brother Wa praised that many were very talented and very amazing, many were good actresses. He said, "Wu Ting Yan is great, she really knows how to act. With recent new comers I look at Miss Hong Kong and Miss Chinese International performances. I wouldn't mind leading new comers, I have been one too. Guiding new comers would make the industry even better. Starting with Miss Chinese International has its advantages, the performance would be more nature. Being able to merge into Hong Kong culture would be even better." As for his condition for returning to the series, Brother Wa said, "Everyday at least ten hours of rest, only then would I have enough energy. I have money demand too, I am expensive. I hope to make back what I didn't make when I made series before to buy a home. I am just joking, relationships and scripts are the most important. Sometimes when I work with new directors I would only take a little lai see." Brother Wa and his family last Christmas went to Finland, so for the Lunar New Year he has planned to go someplace tropical with his wife and daughter. Tong Sze Wing said that on Best Actor Brother Wa's rare visit to TVB City, she would take him to try the canteen's barbecue. On this rare collaboration with the Best Actor, Wing Sze received his advice of being a little "bad" and adding her own ideas. Wing Sze said, "Brother Wa said that being an actor back then was very tough. Now it is much more comfortable. He told me to be 'bad' when I act, have more of my own ideas and not always following the script exactly." Fong Lik Sun said that she was already a television Best Actress and was qualified to be "bad". Wing Sze shook her head and said, "Not yet, I can't always make changes. Sometimes it would depend on the co-star. Earlier when working with (Vincent) Wong Ho Shun I added more movement, but I didn't change any line." Siu Fong said that he has always lead actors and actresses bringing their own screenwriters to the set. He did not as he would do his part. In the film Wong Yuen Chi had many scenes with Carina Lau Ka Ling and learned from her. She felt that Sister Ka Ling had a presence, pretty and professional. Her eyes were drawn to her. Wong Yuen Chi already worked on her third Lunar New Year film. She felt that this was a Hong Kong tradition, being able to spread joy to everyone was happiness for her.